We found this photograph on a dealer’s website, and managed to identify him from his shoulder brand. A small collective of people began raising the funds to buy and move Miss, as we called him, to safety. 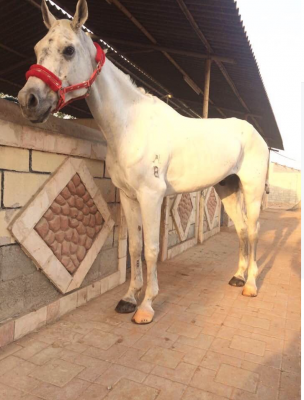 We called in favours from those we have links to in the UAE and neighbouring Gulf states, the lengthy and complicated process of sorting the vet fees, paperwork, the buying, the transport, and a new home ensued. According to the FEI database, he was chipped, so we would simply need a replacement passport. It seems astonishing that the passport needed to be issued by the FEI, as the horse could no longer be considered an athlete, and would need no competition registration. We arranged for a contact to say he wanted to buy Miss, and we used a male native Arabic speaker to do the dealing for us, as our gender and nationality would have had the dealer hike the price. That done, we employed an agency to sort out the vetting procedures and the paperwork. We are all hugely excited, as the vet has been and Miss’s passport has been done. He was chipped too, as the vet couldn’t find the recorded one. All we need to do now is wait for the vaccinations to be completed, bloods done and he can be transported. We have a plan to just put the backdated stickers in the passport, rather than go through the whole process of two sets of injections, as we are concerned about the timescale, and Miss’s resilience in accommodating the vaccines so close together. We are concerned for his well-being, as he appears to be losing condition. We see Miss still advertised, and start to panic. Our contact assures us that Miss is definitely ours, and these will be old adverts. 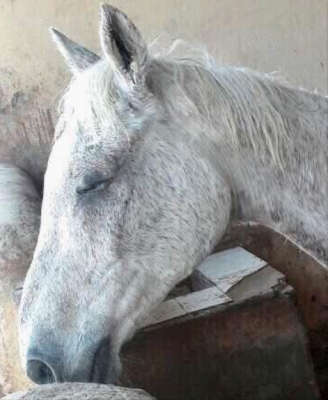 We have a look at the paperwork from the vet that visited, and to our horror discover that the dealer has presented the wrong horse to the vet, so we have another horse chipped and passported to the new owner as Pine Lodge Mississippi, and still we haven’t secured Miss. 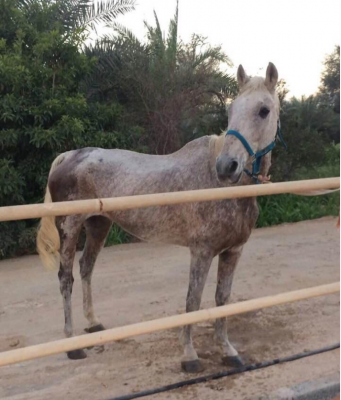 We see a photo of this second horse and he is in a desperate state, and we all decide that we can’t leave him there, it seems like fate this has happened for him, so we make the decision to try to get both these horses out. We called him The Wrong Horse (TWH). We don’t know his origins, he has no chip. 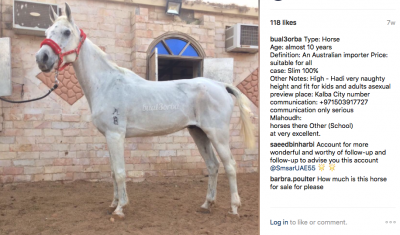 We hope that maybe with this blog in the public eye, someone recognises his distinctive ‘blood’ marking over his quarters and can tell us more about him. You can read more about him in the link under his name. We set up a page on FB to ask for help to fund the costs of getting Miss to safety, and are overwhelmed with the generosity and response from a tiny group of people around the world. 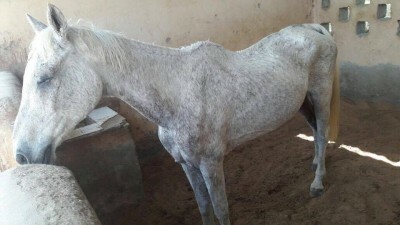 We have decided to try and fund TWH ourselves, as he only needs a blood test and export license. The agency is brilliant in helping us sort out the problems with the paperwork and passporting. TWH is now registered as Pine Lodge Mississippi too. Except when the real Pine Lodge Mississippi was registered he was registered as P L Mississippi. And still, we haven’t paid for either. Confused, much? We finally have enough money to secure Miss with a deposit! The agency need to know if we are going to take both horses, as all the paperwork needs to be started this day. The group member doing the organising behind the scenes is beyond generous, and covers the costs from her own pocket until such time as funds are raised to pay her back. Miss has been passed fit for travel by the vet, but not so TWH. He’s in dreadful condition, and we don’t even know if the dealer is feeding them. We are just hoping that by some miracle he hangs in there, and the vet allows him to go. We plan to have a saline drip to give IV en route if necessary, as the journey to quarantine in the new country will take many hours. 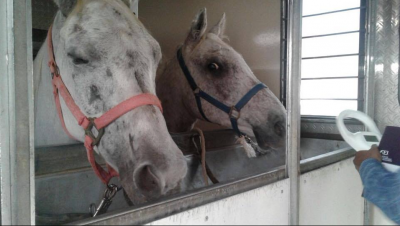 They will need to stay in quarantine on arrival at their destination for at least 4-5 days. We have Miss’s passport sorted! We break the news to the fundraising group about TWH too, and people are astounding with their generosity. We realise we have nearly enough funding to make this happen! After discussion, we decide to look at the cost for paying a transporter to move Miss and TWH, because we think having a truck with aircon might be all that sways the vet into issuing TWH with a Health Certificate and thus permitting him to travel. We are hoping beyond hope for this, as the only alternative would be to have him euthanased at the dealers. We have too much emotional investment in him to leave him there to an unknown fate. 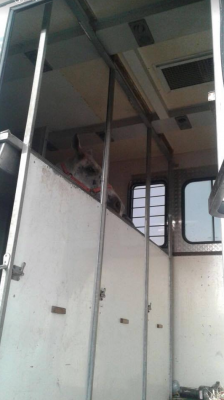 The ministry vet visits the horses, and takes bloods, and we book the transport, again having to pull a few strings in high places. We are all on tenterhooks hoping and wishing that it all goes according to plan. The Ministry issue health certificates! We can now export the boys. Yet now we have another problem! The official dealing with the imports for the new country isn’t available due to illness, so once more there is frantic behind the scenes action until everything is sorted. We are all sick with anticipation, as they’re not safe until they are over the border. There’s a lengthy wait at the dealing yard as the truck manages to get lost on the way there. The horses are brought out to a big six-horse AC truck, and a really strange incident occurs. They went to load Miss first, and TWH was out of sight. Miss didn’t just refuse to load, he reversed about 20m. After a couple of failed attempts, they changed horse and TWH loaded straightaway. Miss then walked straight on without a bother on him. He was making sure the little guy wasn’t left behind! Finally, the boys are into the cool of aircon and on their journey to safety. The new owner is following them to ensure there are no issues at the border. The further they go, the narrower and windier the roads become, and we are adrenaline charged because there’s a real worry that the police will stop the truck for being too big, and that all our efforts will have been in vain. THW looks really bright in this photo, like he can’t believe his luck that he’s there! The truck is checked at the border, and all is well, despite taking nearly FOUR hours with the to and fro of across-border discussion concerning paperwork. The policeman who checked them knew nothing about horses, but even he asked why TWH was so thin. 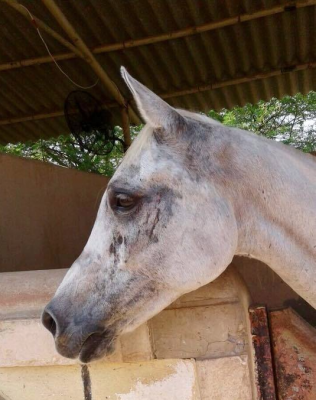 The horses finally arrive in quarantine at 3.30 am, in their new country. They’re safe, unlike the multitude of other Antipodean or European horses advertised with the dealers, whose fate we are unable to alter.